This is a review for the supplement Purity Products Brain Vitality. The manufacturers claims that this supplement will support memory, focus, sharpness and recall. Read on to learn more about this product and whether or not it is the ideal choice for you. Acetyl-L-Carnitine- Works to support the receptors of cell membranes and mental alertness. Phosphatidylserine- Works to support memory and brain aging. Alpha GPC-Works to support cell-to-cell communication. Please note: This product contains soybeans, is vegetarian and gluten-free. This may be appealing for those with a restricted diet. It is recommended that two to four capsules be taken daily with a meal. A physician may also recommend a dosage that they feel is appropriate. There were no possible side effects listed on the manufacturer’s website. Customers may discuss the usage of this supplement with doctors in order to learn appropriate dosage in case there are side effects. This product costs $67.95 per bottle. Customers can also purchase bottles for $49.95 each if they sign up for automatic shipping. Customers can also order four bottles at $67.95 each and receive one for free. Volume Pricing is available for those who want to order multiple bottles. Depending on how many bottles you order, the pricing is as follows: 12-23 bottles for $44.95 each, 24-47 bottles for $42.95 each and 48-95 bottles for $40.95 each. Each bottle contains 120 capsules, which a two-month supply. The manufacturer does not appear to offer a guarantee for this product. Customers may find this to be an issue because they may not be able to return the product and receive a refund if they are not satisfied. However, the lack of a guarantee doesn’t mean that customers cannot return the product for a full or partial refund. There are several customer reviews and testimonials available on the manufacturer’s website. All of the reviews for this product are positive, which is a good sign that this product has worked for people who have used it. 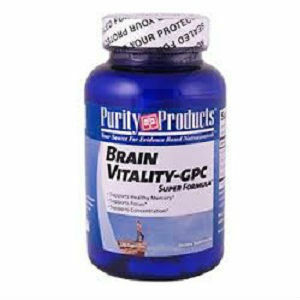 Purity Products Brain Vitality is said to support memory, focus, sharpness and recall. There are many customer reviews and testimonials that back up this claim, which is a good sign that this product does in fact work. Keep in mind that individual results may vary and that just because it worked for someone else doesn’t mean it will work for you. This product may also appeal to people because it is vegetarian and gluten-free. The price per bottle is affordable for most, but the lack of a guarantee may prevent people from purchasing the product. The lack of a guarantee is questionable and people may not want to risk not being able to return the product if they are not satisfied with it. However, the lack of a guarantee doesn’t mean that the product can’t be returned for a full or partial refund. Overall, this product could work for you depending on what you are looking for. Henry Costa	reviewed Purity Products Brain Vitality	on June 14th	 and gave it a rating of 3.